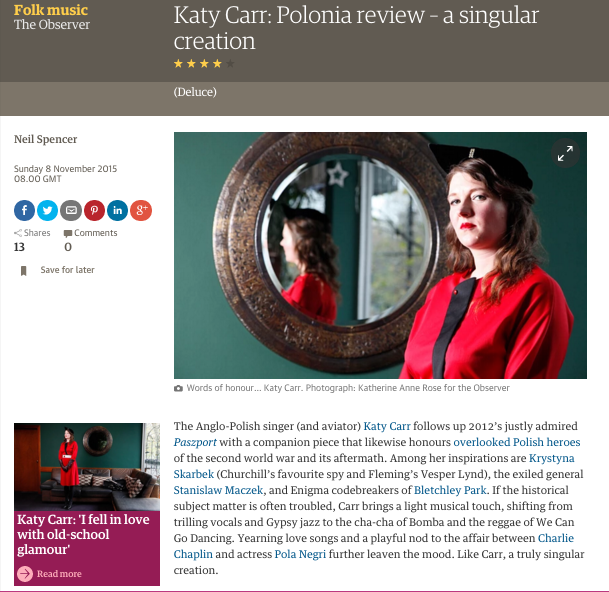 The Anglo-Polish singer (and aviator) Katy Carr follows up 2012’s justly admiredPaszport with a companion piece that likewise honours overlooked Polish heroesof the second world war and its aftermath. Among her inspirations are Krystyna Skarbek (Churchill’s favourite spy and Fleming’s Vesper Lynd), the exiled generalStanislaw Maczek, and Enigma codebreakers of Bletchley Park. If the historical subject matter is often troubled, Carr brings a light musical touch, shifting from trilling vocals and Gypsy jazz to the cha-cha of Bomba and the reggae of We Can Go Dancing. Yearning love songs and a playful nod to the affair between Charlie Chaplin and actress Pola Negri further leaven the mood. Like Carr, a truly singular creation.